One of my favorite movies from the past 5 years is The Social Network, which started as an Academy Award-winning screenplay written by David Fincher about the inception and rise of Facebook. What made the movie so exciting was that it captured the excitement and exuberance of being at the early stages of something that would grow to transform the world. Of course, this experience isn’t more than a pipe dream for the vast majority of entrepreneurs in Silicon Valley. But we rarely hear about those, or the incredible hardship of chasing dreams in such an unimaginably cutthroat environment. 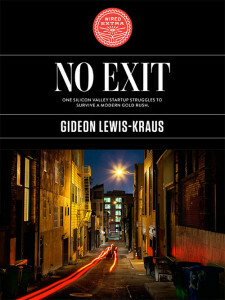 That is what this book is about: the story of the downtrodden, overworked, and bewildered entrepreneurs who come to Silicon Valley everyday by planeload. That’s the price you pay for living the dream and having a crack at the distant possibility of becoming one of the minted legends of the valley. It’s the American Dream of Northern California, and a complement to the American Dream of Southern California: to come from nowhere and rise to notoriety within the impossibly-difficult-to-get-noticed film industry. Los Angeles proudly holds up the Jonah Hills, the Chris Pratts, and the Seth Rogans just as San Francisco has heartwarming stories about WhatsApp, Instagram, and Beats getting acquired for billions. As the author explains, it’s not about a lack of money available to entrepreneurs. It’s that the money you raise is usually just enough to get you in deep trouble: “It’s pretty easy to get enough money to get in over your head and pretty hard to get enough money to stay afloat. The fact is that the rising tide does more drowning than it does lifting”. The counter point that this book offers to the popular culture Silicon Valley narrative has great value. It’s authored by a disillusioned dreamer on the ground and fighting, which gives this testimony additional gravity. I much prefer this first person perspective to that of a journalist recreating the emotional turbulence that actual entrepreneurs experience in this hectic environment. We’re all attracted to stories with a happy ending, and there isn’t one here except for this: lesson learned. There’s a reason why you don’t see people in their 40’s on this grind: the physical and emotional toll that it takes is simply too great.